Puerto Vallarta is a wonderful place that amazes and inspires everyday: a beautiful blue sky that frames a spectacular moon as well as a Sun of an incredible orange. A tempered and generous sea that relaxes, but also imposes, and sunsets that deserve a pause in our day, and take our breath away. A city in the middle of the mountain, the sea, the Sun and the sand, whose inhabitants are kind by nature and eager to serve the visitors. Its geographic location is enviable: a huge bay at the Pacific Ocean, with its blue waters of all blue tones on one side, and a mountain, with fresh temperatures, rivers, cascades and steep lands ready to be conquered on the other. 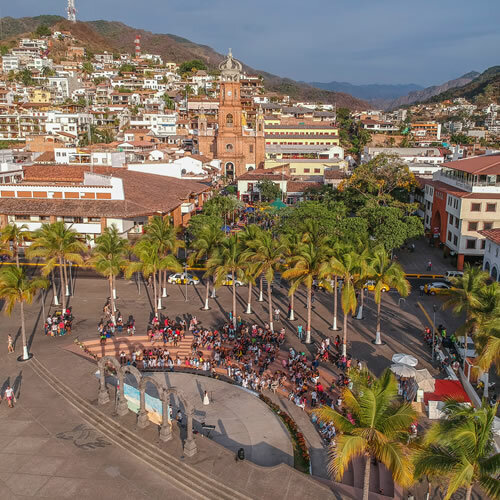 Known as “the Heart of Puerto Vallarta” and declared as cultural heritage by the State of Jalisco, Puerto Vallarta’s Downtown is located between the imponent Malecon and the most emblematic constructions that shape the area. All the way along the Malecon it is possible to find sculptures, artistic manifestations, Huichol art, the worldwide famous Arcos, and spectacular views of Bahia de Banderas. Puerto Vallarta’s Downtown is shaped by the Kiosk, meeting point for festivities and lots of activities for locals and visitors; the City Hall, located at the northern side; and the Parrish of Our Lady of Guadalupe, a neoclassic building located half a block, and whose crown and tower have become an icon of Puerto Vallarta. It is possible to observe this spectacular building from almost every point of the city. 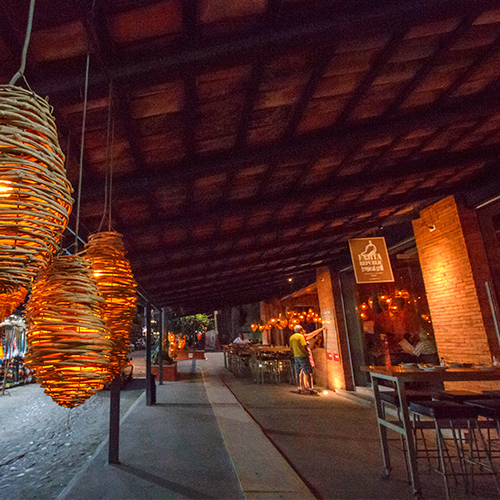 It is one of Puerto Vallarta’s most traditional areas because of its red tile buildings, narrow streets, art galleries, small cafes, bars and restaurants, as well as for its boutique hotels located beach front, and its traditional markets with typical food and souvenirs. It is known as a friendly and diverse area where fun is present during the whole day and night. 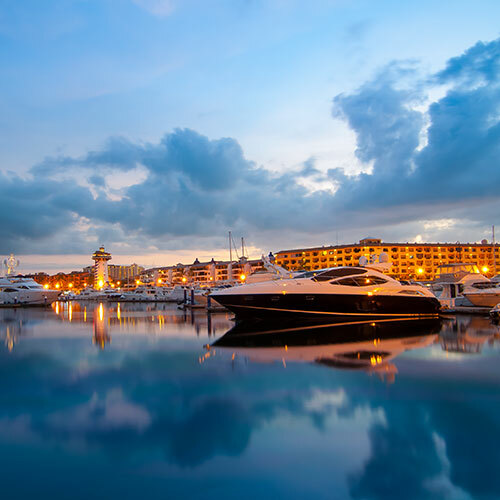 The Marina is a very exclusive area because of its luxury hotels and condos, its yachts, boats and cruise ships, its restaurants that delight all tastes, its cafes, stores and supermarkets where it is possible to buy organic food, art, music and many other products. Because of its wide and modern streets with a “city touch”, it is an excellent option to take a walk while enjoying all of the attractions located alongside. 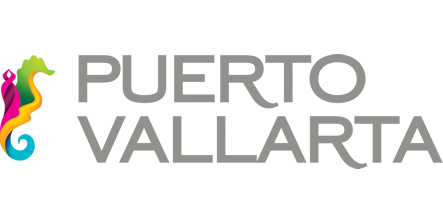 Spreading from Downtown up to the Marina Vallarta, Playa Norte is an area with a vast offering of 5 starts hotels with wide beaches, as well as many restaurants, bars, night clubs and shopping centers located along the main avenue. With world class golf courses, Playa Norte is the meeting point for sports events and conventions and, being so close to the airport, it is considered as cosmopolite. Nevertheless, it is impossible to forget the natural areas where many species, essential for the environment, are preserved. 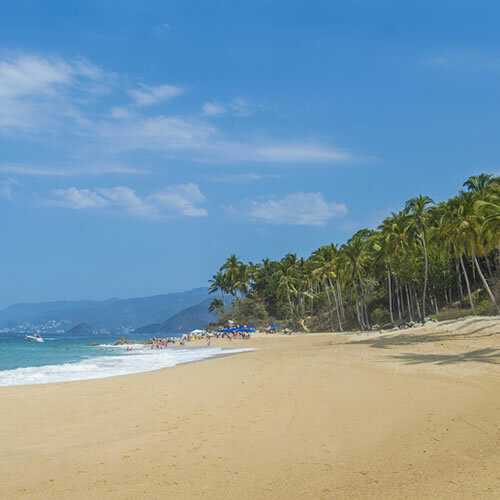 This area is where the most beautiful natural landscapes are found: Playa Los Muertos, Garza Blanca, Boca de Tomatlán, Las Animas and the fishing villages of Quimixto, Majahuitas and Yelapa. Los Arcos National Park, with its imponent size, is one of the favorite spots for national and foreign visitors because of all the activities that can be done. In addition, several world class resorts are located nearby. The Botanical Garden is also an excellent option for Nature lovers since it is possible to look at the region’s flora and fauna throughout its halls and patios. Paradisiac places in the middle of the tropical forest that connect with river streams that flow from the Sierra Madre Occidental to the Bahia de Banderas. 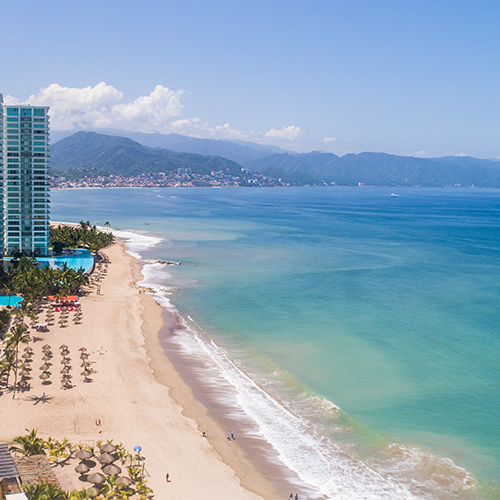 This is Puerto Vallarta’s Playa Sur.